When I first started using Facebook, I was the worst. Giddy with newcomer’s joy and accustomed to the relative “privacy” of the Faire yahoogroups community to which I’d been posting for years, I chatted about personal problems, talked about financial woes, delved into health issues (facepalm), and posted game apps like they were horserace scores. I was out of control. I confess, it’s taken me longer than it should have to get even a little bit Facebook savvy — and still sometimes I slip. With that said, here are tidbits I’ve gleaned as to what makes a good post on Facebook. These are lessons I’ve learned; your mileage may vary. In other words, I’m not trying to tell you what to do or how to post. Okay, maybe I am, just a little. 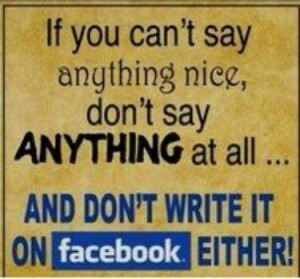 And there’s the thing: Even though I know better, I’m still guilty of violating my own guidelines at times. But I’m better than I used to be. And I haven’t posted a cat photo in days. 1. Keep posts brief. Long narratives are okay sometimes, if there’s a payoff, but otherwise get a blog. 2. Be entertaining, if possible. Not everyone has the comedic skills of Steve Martin or the writing skills of Stephen King, but do strive to bring a smile. 3. But don’t try too hard. This comes off on Facebook as, well, desperate. 4. Try not to post your Scrabble Bingos or other point scores reached on games. Even those who love you more than life itself really don’t care. Really. 5. You get to post one Petition per year. Choose wisely. 6. Unless you have a very “interesting” group of friends, know that if you routinely post cat photos and videos, the audience for those will be very small. 7. Life vignettes of the “you’ll never believe what happened to me!” variety are great. Refer to guidelines in #1 and #2 above. 8. As in Real Life, politics and religion are dicey. Understand that you may be starting something you didn’t want to start, and you’re not going to change anyone’s mind. But if your inner activist is nevertheless called to Facebook, preach away, children. However, the caution of #6 applies here. 9. You don’t really need to be warned about ads or spam, right? 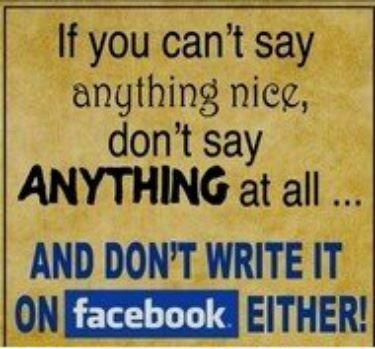 Or personal posts about money, health, personal relationships, your job, your boss, etc.? Sometimes people like to post in ways that bring them support for their troubles; who am I to scold? Just tread carefully in these very choppy, very dark waters. 10. Sharing articles that move, inspire, inform and blow the socks right off is wonderful – probably not very many Friends will read them, however. 11. Try to be positive. In general, posting hair-raising news of the day for no good reason (and, arguably, Amber Alerts may be a good reason) isn’t really Facebook-Friendly. Other good reasons include important updates about encroaching fires and horrible traffic jams. A good rule of thumb is the old “before you speak, THINK: is it True, Helpful, Inspiring, Necessary, Kind’? 12. No guilt-tripping. “Like and Post This On Your Status for One Hour or You Hate Jesus and a Puppy Will be Drowned” is no fair. Not all of us like to re-post. 13. A personal request: please no photos of Gruesome Things. I don’t want to have to scroll past you. 14. Funny always wins. Not necessarily Insulting Funny, but funny in the way that hilarious kid in 11th grade was, always making people laugh effortlessly and easily. Fortunately, I have several Friends who are like this and their posts are pure gold. 15. Snopes. Snopes. Snopes. Please God, Snopes.